Dice have been used for gambling for hundreds of years, but easily the most recognizable dice game in the casino is craps. Online craps recreate the excitement of the real deal but give everyone a chance to be the shooter. Throwing the dice sounds easy enough, but playing and winning craps is about a lot more than a flick of the wrist. 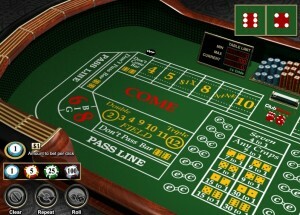 As with other casino games like roulette, craps has a betting layout that covers the entire table. Unlike other casino games, players will throw the dice across the table, chips and all. When you play craps online, you will have the choice of playing at a group table or a solo table. At a solo table, you can always be the shooter, but at a group table you will have to take turns just as you would at a live casino. Whether you are acting as the shooter or just a spectator, it’s important that you understand all of the craps rules. Fortunately, online craps makes the process much easier by automating the shooter options and by allowing you to click anywhere on the betting layout to place your chips yourself. That said, when you’re playing with real money, you don’t want to throw your chips just anywhere. Before every roll of the dice, there is a period where the table will take bets. A button on the table will designate if the betting period is “On” or “Off.” Every player at the craps table must make either a “Pass” or “Don’t Pass” bet. Once those bets are placed, players can also make additional bets on everything from a single to multiple rolls. One bettor will be designated as the shooter, and they will control the dice until they lose. Once the shooter is ready, betting is closed and the “come out” roll commences. Once a point is set, that becomes the new goal for Pass bettors while Don’t Pass bettors should be hoping for a 7. The shooter will roll repeatedly until they hit either that point or a 7. Hitting the point again results in a win for Pass bets while hitting a 7 before hitting the point will yield a win for Don’t Pass players. When the round has concluded, losing bets are cleared and winning bets are paid. In online craps, your winning bet will remain on the table for another round unless you choose to collect it.